Transat has announced that it repatriated its 113 travelers from the Royal Decameron Indigo Beach Resort and Spa in Haiti. Air Transat flight TS667, an Airbus A310 of 250 seats, departed from Toussaint Louverture International Airport in Port-au-Prince at 4:30 p.m. and landed at the Montréal-Trudeau Airport at 8:50 p.m. Above Copyright Photo (all others by the airline): Air Transat Airbus A310-308 C-GLAT (msn 588) PRG (Ton Jochems). Image: 945712. Late afternoon on February 15, travellers were informed that they would be leaving the Royal Decameron Indigo Beach Resort & Spa, located on the Côte des Arcadins, by helicopter the following day. And, at around 9 a.m. on February 16, the first passengers were transported to the airport, and rotations continued for a few hours. The evacuation was orchestrated by Transat, in collaboration with the local authorities, the Canadian Embassy in Haiti and the Canadian government, to ensure the safety of the passengers. Until further notice, Air Transat will continue to operate two flights a week to and from Toussaint Louverture International Airport in Port-au-Prince, on Wednesdays and Sundays. Transat A.T. Inc. is a leading integrated international tourism company specializing in holiday travel. It offers vacation packages, hotel stays and air travel under the Transat and Air Transat brands to some 60 destinations in more than 25 countries in the Americas and Europe. Based in Montreal, the company has 5,000 employees. 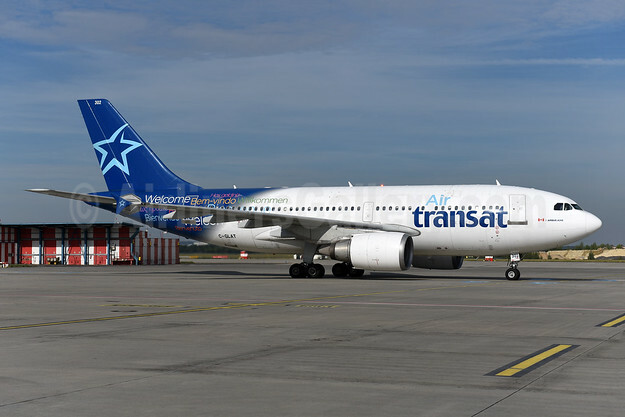 This entry was posted in Air Transat and tagged Air Transat, Airbus A310-308, C-GLAT, msn 588 on February 17, 2019 by Bruce Drum.